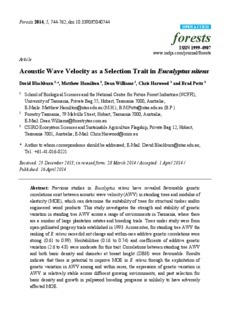 Previous studies in Eucalyptus nitens have revealed favourable genetic correlations exist between acoustic wave velocity (AWV) in standing trees and modulus of elasticity (MOE), which can determine the suitability of trees for structural timber and/or engineered wood products. This study investigates the strength and stability of genetic variation in standing tree AWV across a range of environments in Tasmania, where there are a number of large plantation estates and breeding trials. Trees under study were from open-pollinated progeny trials established in 1993. Across sites, for standing tree AWV the ranking of E. nitens races did not change and within-race additive genetic correlations were strong (0.61 to 0.99). Heritabilities (0.16 to 0.74) and coefficients of additive genetic variation (2.6 to 4.8) were moderate for this trait. Correlations between standing tree AWV and both basic density and diameter at breast height (DBH) were favourable. Results indicate that there is potential to improve MOE in E. nitens through the exploitation of genetic variation in AWV among and within races, the expression of genetic variation in AWV is relatively stable across different growing environments, and past selection for basic density and growth in pulpwood breeding programs is unlikely to have adversely affected MOE.